Take precautions to avoid these nasty pests! As a rabid turkey hunter, I take to the woods like its my job. I never turn down an opportunity to go turkey hunting. My husband and I got a great invite to a friends “cabin” which turned out to be more like the mac daddy of all hunting cabins located just north of Columbia, SC. The property is absolutely gorgeous and the turkeys are plentiful. We had an incredible morning watching a huge turkey strutting for hours but he would not respond to our calls. That afternoon my husband and I agreed to split up to increase our odds of getting a shot at a turkey. Again, we were so lucky to see them, but could not get a clear shot. I found myself doing everything by the book… I sat motionless, fully camoflauged and ready for action. The giant pine tree I leaned against was perfect. I caught a slight motion to my left and saw two huge Toms walking through the woods towards the river. The woods were dense and I did not want to take a shot that I did not think I could make, so I passed it up. So I did not bring home a turkey that particular day, but I did bring home something else…. 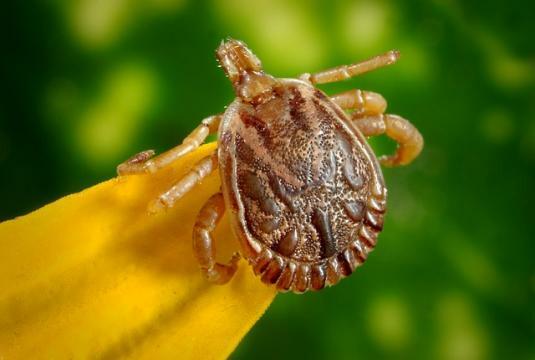 And now back to the issue of the tick and the point of the story….Even after a thorough shower that night, I woke up and noticed what appeared to be a small scab on my stomach. I did not recall scratching myself but did not think anything of it. I put a little antibiotic cream on it so that it would heal fast. The next day, I realized that the scab was a tick. The antibiotic oil had probably smothered it and it fell off easily. It was clearly a dang tick. I freaked out and put it in tiny plastic bag and ran to the doctor’s office. He said that it would be a good idea to take a course of antibiotics just in case which I did. Not all ticks carry diseases, but I did not want to take any chances. I am pretty certain that the tick got in my ponytail when I leaned on that pine tree for so long and it made its way to my belly. I am a lot more careful now. I have a hooded turkey jacket that is great for keeping unwanted bugs away when I am turkey hunting. The most important thing to do is to spray your OUTER WEAR with Permethrin ! It repels and kills ticks, chiggers, and mosquitoes. This is the most effective product I have found. Stay safe and have fun! !